"End of Kalonzo Musyoka in Eastern region if he quits NASA." Says Kamba elders. - Bana Kenya News, Real African Network Tubanane. Home News "End of Kalonzo Musyoka in Eastern region if he quits NASA." Says Kamba elders. "End of Kalonzo Musyoka in Eastern region if he quits NASA." Says Kamba elders. The majority of the Kamba community elders are worried about the wiper leader Kalonzo Musyoka unpredictable behavior in Politics. They said that he has managed to hold all the Ukambani leaders together for the next general elections. They also said that in any case that will make Kalonzo Musyoka move out of NASA will be the end of him in Ukambani. "If the wiper leader will go out of NASA and stand alone then that will be his political grave." said one of the elders. The wiper leader received Hon. Dr Abdi Nur, former MP for Bura constituency and current County Assembly Speaker and Chairperson of the County Assembly forum. Dr Nur now vying for Governor of Tana River County. 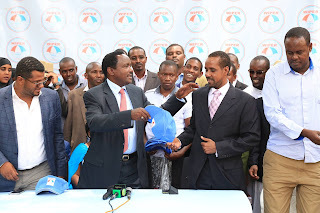 Recently the party has gained a lot of support following the ODM and Jubilee fallouts. It was alleged that the wiper leader wanted to move out of the NASA coalition because of the disagreements made by his members in the party about who to be the NASA flag bearer. He has managed to bring back Hon Charity Ngilu and completed the infighting between the Makueni governor Kivutha Kibwana and his senator Mutula Kilonzo Junior. The only one who is left out in Ukambani as party of Kalonzo Musyoka strategy and also is not in NASA is the Machakos Governor Dr Alfred Mutua. The wiper leader has rubbished the claims that he is hoping to leave the coalition. He said, " I rather become a sweeper in the NASA coalition government than being a leader in Jubilee. I am in NASA to stay and hopefully, will be the flag bearer." The frustrations which are in Jubilee are enormous because they have left with one region and a half(Central region and half of Rift Valley) where they have supporters as claimed by the Mombasa senator Omar Hassan. "If Kalonzo Musyoka quits the NASA coalition then the watermelon slogan will be real and we are not fools to see one leader moving back and fourth the community. All the other deals he had were all ruined so now he needs to stay in NASA or else he forgets to be a Kamba King." said the angry elders.